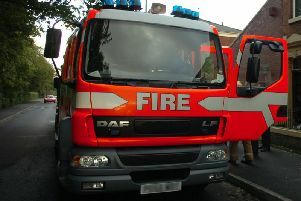 Firefighters have issued a reminder about using fire guards after a blaze broke out this morning. A woman put some logs on her fire, lit them and put a fire guard in place at her home on Dallas Road, Lancaster. She then went out, leaving the fire burning. But sparks went through a slight gap in the fire guard, setting alight a wooden lantern and starting a fire in the front room. A passer-by spotted the flames and called the fire service at 10.40am. Crews from Lancaster fire station broke a window and tackled the blaze. Shortly afterwards, the woman returned home and let firefighters into the house. There was severe damage to the wooden lantern and surrounding furniture and moderate damage to the rest of the room. Watch manager Warren Topp said: “We were quite lucky that it was detected early and we were able to put it out.